Arcanum senior Wave Meeks pitches the Arcanum Trojans 10 a 13-1 win over National Trail. NEW PARIS – National Trail is expected to be in the upper half of the league this season. 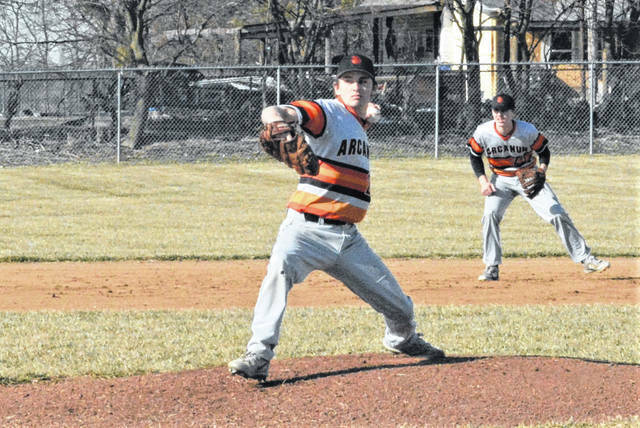 But the visiting Arcanum Trojans had hot bats despite the cold March weather and made mincemeat of the Trail pitching and would run rule the team for a conference win 13-1. Defensively the team excelled as well. The winning pitcher, Wade Meeks, only allowed a single run. And almost as importantly in the era of pitch counts, he did it in 76 pitches so that gives the team some flexibility in their upcoming games – one of of which is against Tri-County North, a perennial contender for the league championship. Meeks helped his cause on the other side of the plate – going 2-3 with a bat in his hand. The team defended well, committing few errors. Centerfielder Isaac Hootman made several nice catches and second baseman Trevor Fry fielded some sizzling grounders. While Arcanum went with Meeks on the mound. Trail used 3 different pitchers to try and slow down the Arcanum offense. But it was to no avail – the Trojans scored runs against all 3. The team started tentatively in the 1st inning – getting a runner on board, but failing to advance him. Trail managed a run in their half of the inning on a sacrifice fly and held a brief lead after 1 inning. But Arcanum found the plate 4 times in the 2nd inning. Trail errors aided the Arcanum cause – allowing 2 runs to be scored. Evan Atchley had a close play at the plate when the pitcher fielded a slow rolling ground ball and made a wild throw to 3rd base and he took off for the plate. The ball arrived half a tick late, and he was called safe. Arcanums defense had a 1-2-3 inning against Trail and that left them them with a 4-1 lead. Arcanum would not look back after that inning and kept the momentum the rest of the way. Arcanums longest hit of the night was by Stastney who bounced one off of the wall. He tried to stretch out an easy double into a triple but was just barely thrown out. He would be 2-4 at the plate on the night. Lane Byrne had a good night – 4 of 4 from the plate and he scored each time he reached base. Next up for Arcanum is an always tough Tri-County North team. Hitting: Meeks 2-4, Stastney 2-4, Ross 1-4, Gostomsky 1-4, Byrne 4-4, Atchley 3-4, Fecker 2-4, Fry 2-3, Wogoman 1-1, Hootman 1-4.
https://www.dailyadvocate.com/wp-content/uploads/sites/34/2019/03/web1_8-inches-JC-Meeks-BB.jpgArcanum senior Wave Meeks pitches the Arcanum Trojans 10 a 13-1 win over National Trail.